Home :: Song / TV / Movies Cars :: 1958 Fury "Christine" Movie Car (More Arrived!) DIRTY Version! 1958 Fury "Christine" Movie Car (More Arrived!) DIRTY Version! #AWSS119 - IN STOCK in 1:18 scale is the famous 1958 Plymouth Fury in 2-tone Red & White as the "Christine" movie car - DIRTY VERSION! The car has real chrome trim and moldings, opening hood, opening doors, and opening trunk, just a bit dirty and rusty looking. Also has working headlights - just locate the small switch under the car, near the front area of the drivers side rear wheel. This is a very desirable cool Mopar movie car, in their Silver Screen Series, and they are (again) here in stock. NEW UPDATE LINKS - Always added! 4/16 Some Photo's Added & More Delivery Updates! 3/28 LATE Added to Older & Harder to Find Area! 3/26-27 Many Delivery Updates and Photo's added! 3/20 Monster Truck Update: Opening Features! 3/16 Many SALE Items Added & Price Reductions! 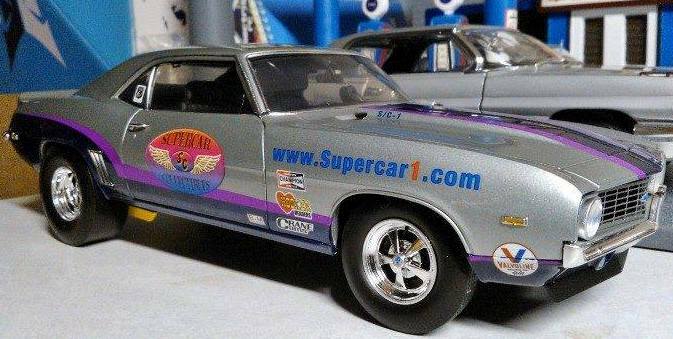 1969 Camaro "Supercar1.com Drag Car" (402 made) Few Left!